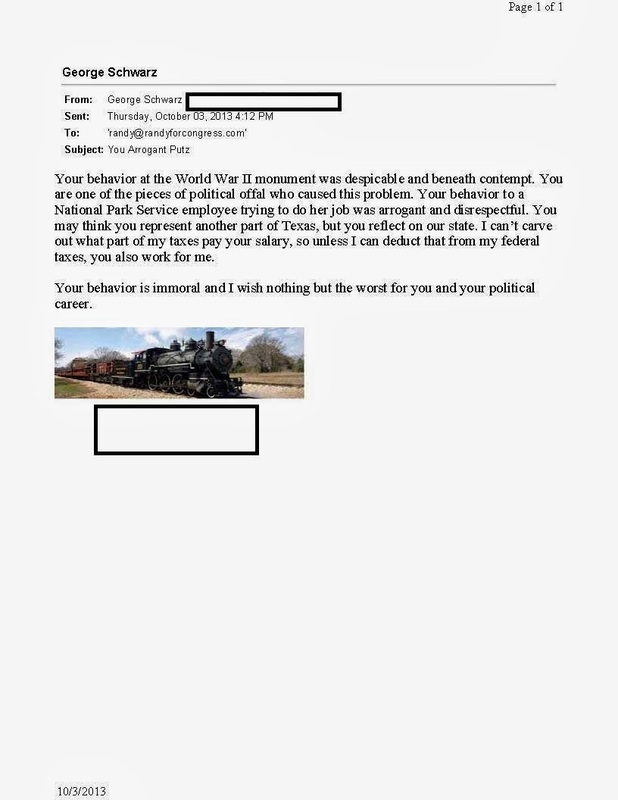 Rep. Randy Neugebauer, a Tea Party wannabe who sided with the rest of the right-wing crazies on the government shutdown, displayed such an egregious lack of class toward a federal employee who here. I guess I've gotten used to politicians being inveterate liars and mealy-mouthed jerks, but my blood pressure jumps to great heights when I see this kinds of hypocrisy. 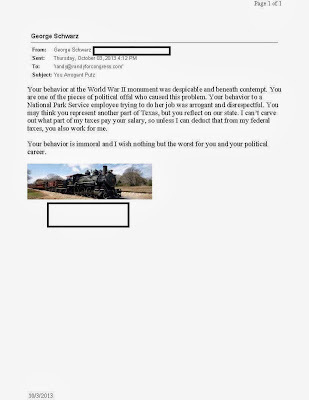 It's hard to get directly to politicians of Neugebauer's ilk, but I am putting a print out of my email to him in the snail mail as well. A photo of it is to the left. I doubt this jackass will every see it or even care, but maybe if we get enough to his staff, he might admit he "misspoke." Of course ,that will be another lie. What are the chances of seeing the video (You Tube link) and getting it splashed across SM channels? It's an NBC video on Gawker. It is linked in my post. I haven't check YouTube. According to news reports today, it's gone viral.